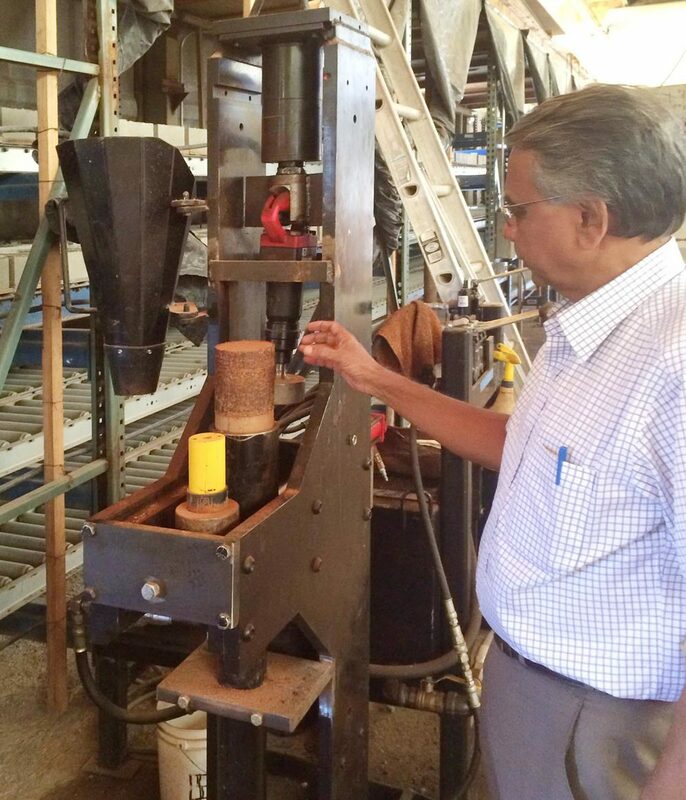 Dr. B.V. Venkatarama Reddy of the Center for Sustainable Studies at The Indian Institute of Science in Bangalore visited the Watershed Materials research lab and production facility in Napa, California. Dr. Reddy toured the Napa/Sonoma Wine region to inspect first hand some of the rammed earth and PISE homes and wineries constructed by Watershed Materials’ sister company Rammed Earth Works. Along the way, Dr. Reddy visited one of California's most historic sites, the Sonoma Mission and Barracks, built of adobe bricks over two hundred years ago. The staff at Watershed Materials and Dr. Reddy got down to business in the lab for two more days of intense collaboration. They designed and implemented a new testing program to evaluate a series of seven new binder combinations to further reduce Portland cement in masonry and developed a protocol for measuring and controlling compactive energy in the Watershed Block manufacturing process. Dr. Reddy evaluated Watershed Materials first prototype low cement block production machine and asked a lot questions about it's inception. He was quick to perceive the challenges we're dealing with, and was admittedly impressed, especially by the lever arms designed to increase mechanical advantage in the Watershed Block manufacturing process. Not inclined to waste a valuable opportunity of working with the Watershed Materials technology fabricators, Dr. Reddy shared an alternative method to evaluate linear shrinkage, allowing for quick and easy measurements. The Watershed Materials lab is evaluating seven new mix designs that incorporate lime and gypsum along with Portland cement and slag. These samples will undergo a strict curing regime after which they will be tested for compressive strength and shrinkage, and the results will be evaluated in collaboration with Dr. Reddy. Watershed Materials looks forward to continuing collaboration with Dr. Reddy and the Indian Institute of Science.